Every now and then I like to experiment with completely new ingredients. I just go grocery shopping and I pick one thing that I’ve never cooked before. If I’m lucky, I discover a great new flavor and that one ingredient usually ends up on my go-to shopping list. This time, I was wandering along the store’s aisles when I stumbled upon an acorn squash. I liked its shape and its color, so I decided it would be my new ingredient of the week. This recipe turned out to be one of my favorites so far! It’s full of sweet and savory flavors, healthy, filling and beautiful just to look at. Bon appétit! Preheat the oven to 425°F. Scoop the seeds out of the 1/2 squash, drizzle with olive oil, add salt and pepper and put to roast flesh down for about 25 min. Flip the half over and bake for another 15 min, until the flesh is tender and the edges are starting to get brown. Meanwhile, sautée the diced onion with the chopped tomatoes in a pan over medium heat. Add salt and pepper to taste, and cook until translucent. Add the ground cumin and nutmeg and keep stirring for a couple of minutes. Bring the heat to low and add the cooked quinoa, a splash of balsamic vinegar, lemon juice with zest and a good drizzle of agave nectar. Then add the fresh parsley and crumbled feta and toss gently. Once the squash is done, scoop the filling into it and top with another drizzle of olive oil and toasted sunflower seeds. TIP: You can add dried cranberry, currants or other berries to the toppings for extra sweetness. 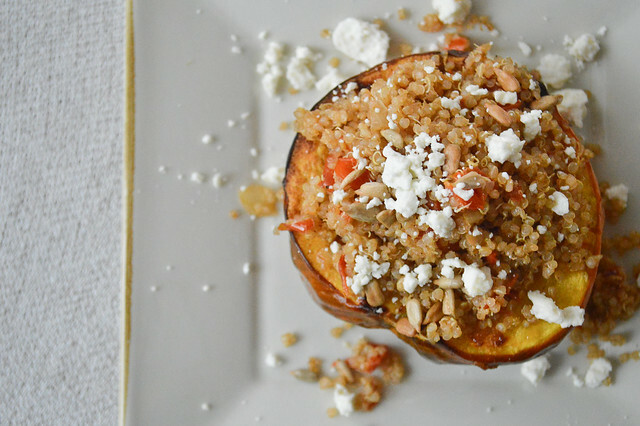 Posted on February 3, 2014 February 3, 2014 by julieadPosted in Main, RecipesTagged acorn squash, agave, balsamic, feta, onions, quinoa, roasted, tomatoes. Wow, I will try doing it. Quinoa is the Super food of the Inkas! Reblogged this on Alexandra's Brain. Wow! This looks delicious! A must try! I’m going to go buy some Quinoa now at Neechi Commons! Looks selfish! Thanks for sharing. Soooooo yummy! New way of presentation! i must try it! That looks amazing, keep the suggestions coming! Looks delicious! I have kind of a similar philosophy when I go grocery shopping. Try to get a new ingredient and then experiment! This looks awesome and prefect for cold winter evenings. Another new idea for dinner. Tasty indeed. Thanks for sharing and great blog. Reblogged this on Energy's Soul Mission. Another good looking recipe with quinoa. 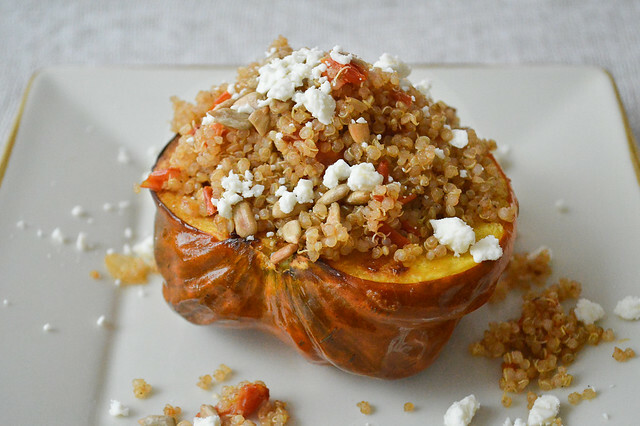 Like the squash and quinoa combination!